The term frontispiece in books generally refers to a decorative or informative illustration facing the title page. Originally from the French frontispice (or the late Latin frontispicium, from the Latin frons (‘forehead’) and specere (‘to look at’)), it was first an architectural term, referring to the façade of a building. However, in the early print period, the convention was to often find the frontispiece on the recto page, where the title-page would normally be. Thus the terms frontispiece and the title-page, usually an engraved one, were treated synonymously. First mention of the frontispiece in English was in 1607 (OED), appearing in Henri Estienne’s World of Wonders. This book is one copy of Gale’s Opuscula Mythologica Physica et Ethica (1688) with the frontispiece sitting on the right hand side. 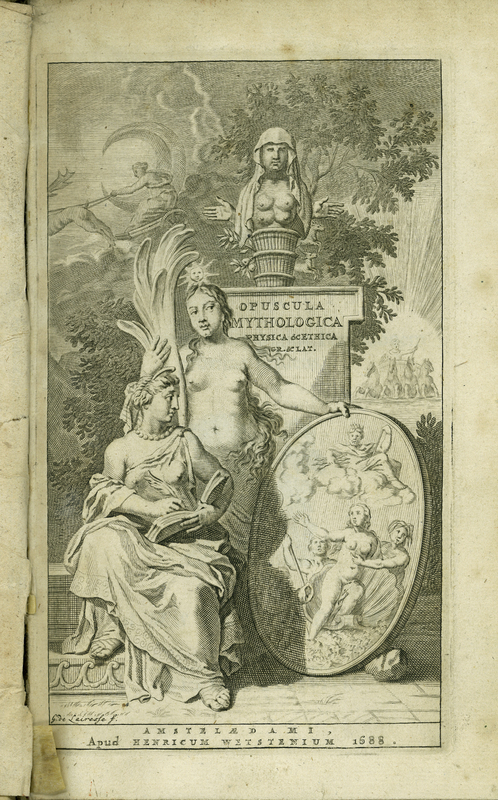 Thomas Gale, “Opuscula Mythologica Physica et Ethica,” ourheritage.ac.nz | OUR Heritage, accessed April 26, 2019, http://ourheritage.ac.nz/items/show/10646.